If you’re looking for a solid, inexpensive way to convert your sitting desk to a standing one, one of our favorite options here at DeskHacks.com is the Executive Stand Steady, which Casey reviewed for us a couple of months ago. A sturdy stand that rests on top of your existing desk, at around $200 a pop it remains one of the fastest and least expensive ways to switch to standing for part of your day, short of cobbling something together yourself. In addition to its reasonable price, the Stand Steady’s most important feature has always been, in my opinion, its stability. And you can put it together in five minutes. Now there’s another feature that really stands out: its height adjustability. A few months ago I posted a review of my Stamina InMotion Elliptical Trainer, a compact elliptical trainer that you can use while working at a standing desk. I noted at the time that it made me about a foot taller and that, when I used it, the buffet I was using as a standing desk at the time was too short. My temporary solution was to pile a couple of boxes on top of the buffet. 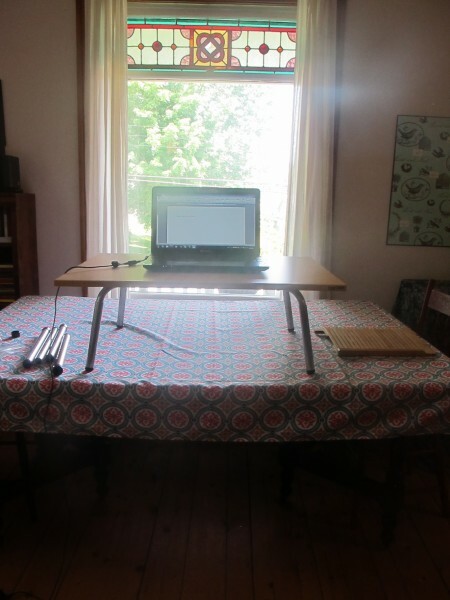 When the folks at Stand Steady saw that review, they offered to send me a Stand Steady desk with a set of the leg extenders you can buy as an accessory to use with the elliptical trainer. My Stand Steady at its lowest height. Those are the leg extenders on the left. The regular Stand Steady desk has a height range of 11.25” to 15.25”. The leg extenders, which will cost you $29.99, allow for an added height range of 16” to 20”. I’ve placed the Stand Steady on top of my dining table, which is the height of your average desk surface. With its regular legs on, it works well as a standing desk for both me and my husband. I’m around 5’5” and my husband’s 6’0”. Adjusting the height of the legs is easy – you simply press the snap buttons and lift or lower the leg to your preferred height. In order to use my elliptical trainer with the Stand Steady, I do need to use the leg extenders, but only to add an additional inch or two. And my husband needs only another couple of inches on top of that. Someone who is, say, even 6’2” could use the Stand Steady with leg extenders and the elliptical trainer at the same time. If you’re looking to convert your sitting desk to standing and you’re particularly tall (over 6’2”), you know it can be tricky. It’s hard to find even a high-end standing desk that will work for really tall people. In cases like this, the Stand Steady with leg extenders is a great solution. You’re not likely to find one at a better price. In summary, there are plenty of “desk-top desks,” for lack of a better term, on the market that promise to easily convert your sitting desk to a standing one. We here at DeskHacks remain impressed with the Executive Stand Steady, particularly in combination with the leg extenders, which make this product particularly versatile. Hi there, have you guys seen DeskStand from http://www.DeskStand.co ? They make sustainably, conscious sit-stand standing desks. They also 100% Bio-degradable. Check out their video on their font page, very cool!